All patient contacts at Royal Primary Care are on an appointment basis. We do not offer a walk in service and we do not assess acute minor injuries. For information on Minor Injuries Units click here. We do not offer or provide any form of dental care. We will not see or treat any form of dental or gum problem. For information on how to find a dentist including how to find an emergency dentist click here. As a patient at Royal Primary Care Clay Cross | Grassmoor you will be able to use the extended access appointments Wingerworth Surgery, Limes Medical Centre (Alfreton), Village Surgery (South Normanton), Clay Cross Medical Centre, North Wingfield Medical Centre and Staffa Health (Tibshelf). This new service, commissioned by NHS England which is part of the Government’s ‘General practice Forward View’ Programme, relies on collaborative working to enable additional patient access. 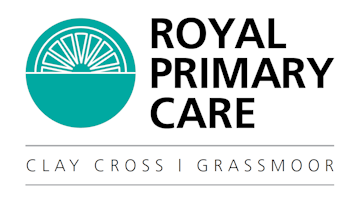 You will still remain registered with Royal Primary Care Clay Cross | Grassmoor and the extended access is in addition to the current services we provide. This additional access will be in the form of pre-bookable and on-the-day appointments which can be booked via Royal Primary Care. This service provides normal GP or Nurse appointments across a wider period of opening hours. It is NOT a drop in or emergency clinic.